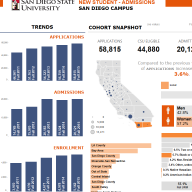 Updated census data for the Spring 2019 semester is now available on the ASIR website. For selected reports on the site, current spring semester figures can be viewed by selecting ‘Spring 2019’ in the term/period drop-down menus. 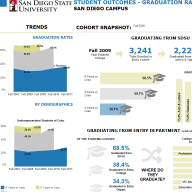 The latest official graduation rates are now available on the ASIR website. 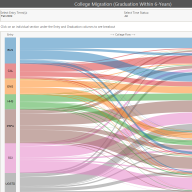 Four-year graduation rates for full-time first-time freshmen jumped eight (8) percentage points from 39.6% to 47.6% for the cohort entering in Fall 2014. 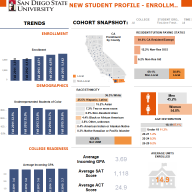 The six-year full-time first-time freshmen graduation rate remained at an all-time high of 75.3% and two-year graduation rates for new full-time upper-division transfers rose from 50.2% to 54.8% in one year. For further details and data, visit the Graduation & Progress sections under Data Tables and Data Visualizations in the site’s main menu. 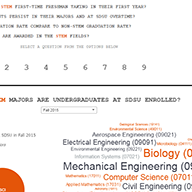 Also, the STEM Advising Tool has been updated with the new data. 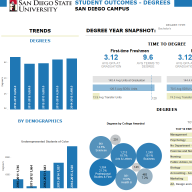 Updated census data for the Fall 2018 semester is now available on the ASIR website. For reports and visualizations on the site, fall semester figures can be viewed by selecting ‘Fall 2018’ in the term/period drop-down menus. Census data processing for the Spring 2018 semester is currently underway. Please be advised that some of the website’s data tables and data visualization dashboards may become intermittently unavailable during this time as data is processed. Updated Spring 2018 enrollment and application figures on the website should become available soon.